My father died 17 years ago today. In this picture of us together, he was four years younger than I am now. When this picture was taken, we didn't yet know it, but his tragedy had already begun. I have more recent pictures of him, of course, but the later ones are too hard for me to look at. I can see the disease in his eyes. Here, although the symptoms had already begun to surface, he still looked relatively normal. My entire adult life, until his death 17 years ago, my father suffered from bipolar disorder, more commonly known as manic-depression. Although there is no known cure, some people with this diagnosis can, with long-term treatment, live relatively normal lives. My father was not one of those people. His mood swings were huge, his depressed periods were prolonged and his manic stages were known to be destructive. When his disease was full-blown, it was not easy to be with him. In the end, he died from pancreatic cancer, just weeks from diagnosis until death. The last time I saw him, I was 10 weeks postpartum. I flew from Baltimore to Florida with my newborn daughter, today a senior in high school. I laid her down on the bed so my dying father could meet her. She was pink and wriggly; his skin was jaundiced from cancer. The memory of that contrast remains strong. Except for his voice, he was unrecognizable to me. Always a hearty man in life, he lay on what was literally his death bed, his body a fraction of its former self. Ironically, my father, who was more than once picked up by the police in his manic phases, who spent time in psychiatric wards, heavily medicated and strapped to the bed lest he hurt himself or others, who called me at 3 AM with delusions that he was at the Kotel (which he always called the Wailing Wall) was utterly lucid in the last days of his life. As we sat talking, a Chanukah menorah at the window, I was able to ask him everything I always wanted to know about him and about our family. He sometimes waxed philosophical with me. "Don't be afraid," he advised, "Death is a part of life." Although his bipolar disorder eclipsed the last decade and more of his life, I always knew, from my earliest childhood, that my father loved me. Once, long ago, just before a birthday, I spotted an unfamiliar carton in the trunk of our car. My father told me it was a tire. How old was I at the time? Seven, maybe 8 or 9? Knowing my father was in the auto repair business, his answer made perfect sense. But the box actually held a doll house, a fantasy gift for a little girl. That story is my father to me. He created worlds, for what is a doll house if not another world? Sometimes he did it with words. Sometimes with gifts. He created worlds when he decorated our homes. In the house of my childhood, there was a game room with a built-in wet bar. In our adolescent rec room, we had black-light posters and the special bulbs that made them pop. My sister and I shared a room where everything was matching shades of green and blue. I had already moved to college by then, but I remember a room in another house with an African jungle theme. And I remember the Jewish theme, the symbolism of which I neither understood nor appreciated at the time. My father constantly created other worlds. Perhaps he was always trying to escape the chaos in his mind. Once, when he visited me in Baltimore after I was already religious, he came to shul on Shabbat morning. Although we sat separately in the small Orthodox shul that was my first spiritual home, I recognized that the men had called him up, as a guest in the congregation, for an aliyah. Gevalt! What did my father know about getting an aliyah? They were going to have to feed him the words of the bracha slowly, one at a time. I was startled to hear him make the bracha, as loudly, clearly and confidently as if he had just done so the Shabbat before. Walking home later, I asked him how he pulled that off. "Didn't you know?" 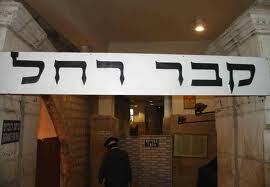 he answered with a sly smile, "My bar mitzvah was in an Orthodox shul. It's like riding a bike. You never forget how." My father was too sick to ever really discuss my return to traditional Judaism, but I have often imagined that, had he been well, he too might have done teshuva and been living as a Torah Jew today. He might even have retired and come to live in Israel near us - me, my husband, children and my brother, his only son. When I lit the yahrtzeit candle for him last night, I thought of how, when I see him again, he will be well. My father's disease was a force in my life for a very long time. But his love was even stronger. When I first met my husband, his physical resemblance to my father spooked me. We married in the late afternoon on the 7th day of Chanukah and, though we didn't realize it when we set the date, that night was my father's second yahrtzeit. My brother, sister and I, uncharacteristically together on that date, lit yahrtzeit candles for him in the wedding hall. Newly divorced with two young children, I met my husband almost 18 months to the day after my father died. Eighteen is a pretty significant number in Judaism. It's the numerical value of the Hebrew word chai, which means life. Once the disease infected his essence, my father could no longer take care of me. But he had a hand in sending me someone else who could. And he sent someone who resembles him, so I wouldn't miss the gift. Fifteen years later, my husband, who never met my father, and I celebrated our Chanukah wedding anniversary in Jerusalem. I often think that my husband embodies all the best parts of my father, a reflection of what my father might have been, without the calamity that was his disease. I got the message, Dad. Thanks for looking out for me. When an awareness dawns, fully formed, we are sometimes blessed enough to perceive it as the Divine gift it is. When I was a newly-minted religious woman, Hashem sent me an insight about the role of women in Judaism. There is no way this understanding was my own because, at the time, I had precious little Torah knowledge. And, in fact, I came to question it over the years, since I had no source for it. But I remember exactly where and on what occasion I first said it out loud, in front of some equally recent ba'alot teshuva and a much respected rebbetzin in Baltimore. The idea was a simple one: that the way women are treated in normative Orthodox Judaism is not God's original intention. And that someday, things would align again with His original intention. In 2006, a book came into my field of vision that basically made the same argument, this time deeply sourced in Torah, with 192 endnotes. The Moon's Lost Light: A Torah Perspective on Women from the Fall of Eve to the Full Redemption by Devorah Heshelis is a book that comforts me every time I feel a twinge arising from being a woman in a traditional Jewish life. I summarized the book and taught its principle points to groups of religious women on two separate occasions over the past year. The first time was my very first teaching experience since making aliyah. And I left that evening thinking that I will never teach in Israel again. The ideas in the book, which I believe are original and brilliant and astonishingly comforting, were not well-received. I felt emotional walls going up as we discussed the book. I was told, "We've all dealt with the 'women's issues' decades ago. We've moved on and we don't want to hear about that stuff anymore." I, who had often received encouraging feedback when teaching adult women for over 20 years, walked away from that experience in shock. I knew my presentation was solid - well-organized,clear and interactive. The only thing I could conclude was that I was not meant to teach in Israel. The very thought devastated me. I was invited to teach an entirely different text a few months later by a different group of women. With trepidation, I agreed. That series of talks turned out to be much more typical of my teaching experiences. So, in thanking them for the invitation, I told this group of women the story of how the last talk had gone horribly wrong and they persuaded me to teach the ideas in the book to them. That was my second presentation of the ideas in The Moon's Lost Light. I've read the book a few times, and am in the middle of yet another reading. This time, it was prompted by meeting the author at a shiur. There is a woman from Brooklyn named Evelyn Haies who, passionate about the message of Rachel Imenu, bought a building near Kever Rachel and started an organization called Rachel's Children Reclamation Foundation (RCRF). 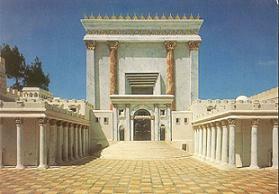 RCRF sponsors Torah talks in a hall very close to the kever. Devorah Heshelis is the pen name of a Bais Yaakov graduate who presently resides in the Jerusalem neighborhood of Kiryat Tsanz. In addition to being a wife and mother of eleven children, she has been teaching women Torah for over twenty-five years. I wanted to meet this woman. Her talk, entitled "The Essence of the Greek Exile", was fascinating. I took copious notes and came home and excitedly told my husband and one of my daughters the highlights. But she was even more fascinating to me. Here was a woman who, under normal circumstances, I would never have met. We don't exactly live in the same weltanschauung. But Torah, and the RCRF, brought us together. As it happened, I went to the shiur with a friend who volunteered to drive the author to her bus stop in another part of Jerusalem. So we got to talk more during the car ride and now we have begun a personal email correspondence. I don't know what lies ahead in our correspondence, but I have already benefited. The whole experience, meeting the author of a book that touched me deeply, learning Torah about exile and redemption in very close proximity to Kever Rachel and beginning a correspondence with a chassidish woman whose life experiences are so different from mine have already been spiritually nourishing. So I was feeling pretty blessed by the opportunities life in Israel provides when we went to a wedding in Jerusalem a few nights ago. Upon walking into the wedding hall, the first thing we heard was the sound of women singing. It caught my attention because it was loud. But also because it was so novel. Walking toward the joyful sound, I saw a phalanx of young women, arm-in-arm, singing and dancing in front of the seated bride. It's common to see this among young men who are friends of the groom's, both in the moments before the chuppah when guests approach to bestow good wishes on the bride and groom and later, at the chuppah, especially if the groom is a yeshiva student or in the army and has a lot of young, energetic male friends. But in my experience, it's rare, and quite delicious, to see young women do this for their friend, the bride. And when a couple of hundred Jews sing Im Eshkachech Yerushalayim at a chuppah IN Yerushalayim, my eyes well up. My heart is full. Thank You Hashem for the many spiritual opportunities, large and small, that nurture my soul. 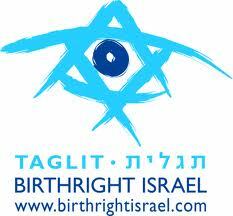 Thank you for the blessing of allowing me to live my life in the Land of Israel. 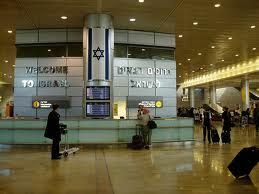 Thursday night, we drove to Ben Gurion airport with a family member traveling to the US for a few weeks. While waiting for her to check her bag, I saw a somewhat raucous group of American college students, joking around while waiting for their turn through security. They were tossing around kitschy souvenirs from Israel and making jokes about what things cost in shekels. Since Taglit: Birthright Israel season has begun in Israel, it's not unusual for me to see groups of college students clustered together in touristy places in and around Jerusalem as I go about my daily errands. This time, in the airport, I had such a wildly novel thought. I know these young people came from a US college campus and just spent 10 days exploring Israel. I know many, if not most of them are Jews with Jewish identities that are still in formation. I know that many of them came to Israel, in large measure, because it was a free trip. I felt a new level of responsibility for representing Israel. I felt compelled to go over to them, let them know that our family lives here now, that we are normal people, that we are Israelis, and that we hope that they had a positive experience here and, if there is anything we can do for them, please contact us. I so wanted to go over to them and say, in my American English, "I hope you liked my country." But I thought about it. And in that thought, I realized how much I identify as an Israeli now. About five years ago, when we still lived in America and my husband was a synagogue rabbi with a prominent community profile, we were invited to attend the annual Chanukah celebration at the Governor's mansion in Annapolis. I remember it especially because it fell on the night of our wedding anniversary. We went to Annapolis and hobnobbed with politicians and leaders of the Jewish community and later, we enjoyed a more private celebration back in Baltimore. At the Governor's mansion, where a large silver chanukiah was placed on a central table amidst Christmas decorations, kosher food was provided, in a separate room in the back, apart from the main celebration. And I remember thinking that the whole thing was farcical. Although Chanukah was the theme, it was an entirely politically motivated evening and I was not impressed. I felt as if the government appropriated a private family celebration, dressed it in politics and paraded it in front of the Jewish community to show how "tolerant" and "ecumenical" they were. I hadn't thought of that experience until yesterday, when I read this article about how the White House kitchen was kashered for the White House Chanukah party. Clearly, a lot of people agree with that point of view. What a nice thing for the White House to do to show how religious tolerance reigns in the US! 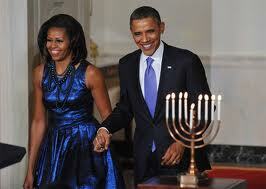 How thoughtful to have a Chanukah party in the White House! How they honored their guests by making the food kosher so those Jews who care about kashrut could eat comfortably! In his radio show on December 9, conservative talk show host Michael Savage did not have anything positive to say about the event. He accused the Obama White House of insulting Jews by having a Chanukah party two weeks too early, for lighting all candles in the chanukiah together and for the impromptu joke Obama made about being happy to kiss and hug everyone there,"except for the rabbis with the whiskers." Savage took issue with the rabbis who acted like court Jews, falling all over themselves to prepare the kitchen and attend the celebration. I posted the New York Times article to Facebook along with this comment: Having the American rabbi supervising the kashering of the White House refer to the White House as,"the most powerful house of our day," is incredibly disheartening. Indeed, it hurts me to hear an Orthodox Jew make that kind of comment. It hurts me to see that some Jews think this sort of event is a good thing. Why are there Chanukah parties at the White House or the Governor's mansion in the first place? Because America is a Christian country and there is a common perception is that Chanukah is the Jewish Christmas. So already, I'm uncomfortable because, as lovely as Chanukah is, it's hardly the most important holiday in the Jewish calendar as we observe it today. So Chanukah gets raised to a level of significance it doesn't truly have, davka because it's being celebrated in exile, surrounded by Christmas. These celebrations have little to do with the meaning of Chanukah and everything to do with politics. This event struck me as particularly distasteful, given the hostility of the current administration to Israel. It reminds me of the status of Jews in Iran today. Ahmadinejad wants to wipe Israel off the map, but Iranian Jews are protected under Iran's constitution. Obama is often named the most anti-Israel president in US history, but American Jews can light the chanukiah and eat kosher latkes at his party. From my perspective, the whole thing was nothing but a hollow PR event, farcical and vacuous. It gives me a stomach ache that so many Jews went along with it. Happily! Proudly! How polite and respectful of us they are! The feeling that some Jews sold out for a kosher latke hurts my soul. But even more troubling than all this is the hostile feedback I get every time I mention something about the perspective of American Jews. I am often told, in a nutshell, "leave American Jews alone." Write about all the lovely little moments in Israel and stop judging us. What I cannot seem to put across to some, no matter how often and in how many different ways I try, is how genuinely pessimistic I am about the future of the American Jewish community and the dangers that lurk there. It's a classic case of shooting the messenger. Like at a simcha, I miss having the whole family together here in the Holy Land, enjoying who we are meant to be. I worry over those of my fellow Jews who clearly demonstrate, by their speech and their behavior, over and over again, that they are much, much too comfortable in galut. I fear that the price they will have to pay for that misguided loyalty will be great. Who am I but a very simple Jew? If it hurts me so much that so many refuse to see what God has asked of us and repeatedly reject the chance to come Home and build up Am Yisrael in Eretz Yisrael, I dare not imagine how devastated Hashem must feel. Largely due to the fact that there was amazing and readily available Rosendorf challah for sale in Baltimore, I only occasionally made challah in America. But for years, I dreamed of making challah in my own kitchen in Israel. It seemed to tie together so many mitzvot. After making aliyah, I didn't actually rush into it. Up until a few months ago, we were still buying challot every week. Not surprisingly, challot are even more plentiful, accessible, diverse and delicious here than in Baltimore. Some months ago, I had an astonishing homemade honey-wheat challah at a friend's one Shabbat and decided to try to duplicate it the next week. 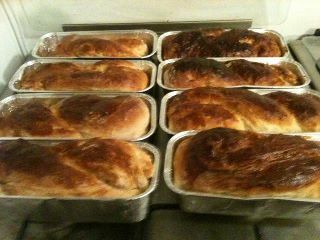 Since then, almost every Thursday night, there's challah baking in my kitchen. As every traditional Jews knows, the mitzvah of challah is actually in removing a symbolic piece of dough, making a bracha and, in the absence of the Beit haMikdash, burning it. During the times I made challah in America, I burned it in the oven, double wrapped it and threw it away with the household trash. Here, I set it on a gas burner on the stove top. Once it starts to char, its odor and smoke permeate the house. If my kids are home, they grouse, "Eew, that stinks!" A few weeks ago, I watched a serious Jew, a religious woman I know, put the piece of dough on which she had made a bracha into a plastic bag, pour dish soap on it, rendering it inedible, put it in a second bag and throw it away. No mess. No smell. I checked with a posek and found that this is a valid halachic option. But it doesn't sit quite right with me. Not because it's not halachic. Historically, I tend toward adopting the more lenient halachic option. But this one seems a bit too easy to me. While the charring piece of dough does make for an unpleasant olfactory experience, it reminds me that this is what we have to do because we don't have a Beit HaMikdash with attendant kohanim to actually give the challah to. To douse it with dish soup and throw it away is a perfectly acceptable option in Jewish law. It just doesn't feel quite right to me. Can't say exactly why this practice, above others, makes me so desire authenticity, but I'd like to think it has something to do with the fact that, on every bus trip into Jerusalem, I pass Har HaBayit and silently say the "Yehi Ratzon" for the rebuilding of the Beit HaMikdash. and other signs of Chanukah's arrival in Jerusalem. I intended to write a light-hearted piece to contrast with the seriousness of some of my more recent posts. Truly I did. But then an issue keep nudging me from different directions and I thought that maybe this is what I was meant to write about instead. I spend a lot of time in the geula world - the largely Internet-based world where people think and dream and learn and write about the Ultimate Redemption of the Jewish people and who search for signs of geula in headline news. Yesterday, there was a whopper. A "Kristalnacht" in Highland Park where five Jewish-owned businesses in Highland Park, NJ had their shop windows smashed. This followed a few days after the Hillel at Rutgers had a brick thrown through the window. Most disheartening to me were the comments on the article urging people to, (I'm paraphrasing here) Stop making this sound like another Holocaust. This is America and nothing bad can happen here because our good non-Jewish neighbors will fight with us against this kind of violence. There are a handful of rabbis who have been exceedingly influential on my thinking, teaching me to wake up and PAY ATTENTION to what's going on in the world, and especially in America. Rabbi Pinchas Winston was the first to teach me the idea that, in whatever Diaspora community we find ourselves, historically, we Jews miss the signs that it's time to move on. We always stay too long. Not only do I spend a lot of time thinking of these things, I also correspond with people around the world who are somewhere in the aliyah process. And lately, I've noticed a trend, a distressing question, a heart-breaking dilemma coming up with ever-increasing frequency. In a nutshell, the dilemma is, "Okay, I get it now. I see where all this is headed and I'm ready to pack my bags and move to Israel. But, there's a huge glitch. I have no money. I live paycheck-to-paycheck and I can't afford a plane ticket to Israel let alone an apartment there. Rabbi X is telling us to leave America and I'm ready, but I don't have any savings/haven't worked in months/can barely buy groceries here, etc. What am I supposed to do now??" What a sad question. What a harsh test. At this moment, the Jewish Agency considers aliyah from America to be aliyah-by-choice. How far are we from the point where the Jewish Agency will revise its perspective and define aliyah from America as rescue aliyah? You may think it's far-fetched, but it's not at all difficult for me to envision the Jewish Agency sending in planes to rescue American Jews, setting up temporary housing here and feeding and clothing them until they can build new lives in Israel. I asked Rabbi Winston what he thinks about this dilemma of people who finally want to leave but find they cannot. His answer, "The truth? They're stuck, short of a great miracle, and they must work on creating a mini-Eretz Yisroel where they live to remain protected, b"H. This can open doors to aliyah they don't even know about yet, and bitachon and emunah is a must." What I think that that means, practically speaking, is that people who are stuck in the US due to financial limitations must talk to Hashem and ask for, beg for, help. I was listening to a shiur earlier this week by Rabbi Lazer Brody, about talking to Hashem and asking for what we need. He told a story of a student in their yeshiva who went to his rebbe, Rabbi Shalom Arush, for help because he wasn't making enough money to pay rent. Rav Arush sent him to the field to do six hours of hitbodedut, private, personal prayer. He came back to Rav Arush shortly after and said that the situation was worse and now he was being kicked out of his apartment. Rav Arush sent him to do six more hours of hitbodedut. Shortly after, he got an inheritance from an aunt and is now living in a paid-off apartment three blocks from the yeshiva. Rabbi Brody encourages 30 minutes of talking to Hashem and asking him for what we need for 30 days. This is emunah in action. Short of a miracle, what else can be said? If you're here already, praise Hashem for your good fortune and say chapter 122 of Tehillim for those who are not yet Home. If you're not here yet but can still afford to come, come now! And if you're stuck, if you want to come but find your cupboard is bare, pray for God's help. Hashem has no shortage of dough.